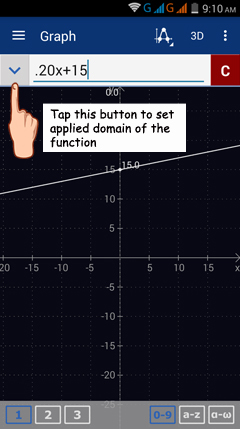 The applied domain of a function is the constrained interval of values where the function is relevant. Suppose a rental company charges $15 to rent a car plus $0.20 for each mile driven up to 2500 miles. Define a function to model the cost of renting a car. If we let y = the cost of renting a car and x = the distance in terms of miles driven, the function of the cost is y = $0.20x + $15. 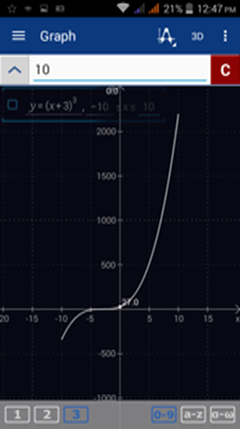 Because the cost of renting a car and the distance driven cannot be negative, the applied domain of the function must be positive such that 0 < x < 2500 with 2500 as the maximum distance. 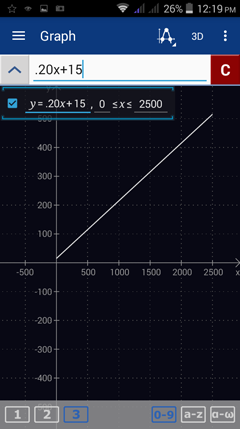 Step 1: In Graph mode, enter 0.20x + 15 in the input field. 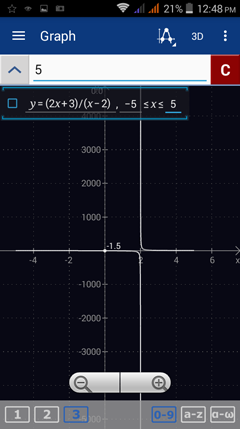 Step 2: Tap the down-arrow on the left of the input field to display the equation and its default interval of values for x: (-∞, x, ∞). Note: the default interval does not necessarily match the relevant domain of the function, especially for rational, radical, exponential and inverse functions that have restricted domains. 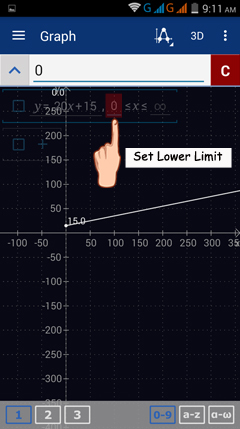 ​Step 3: To set the lower limit of the applied domain, tap -∞. Then type 0 in the input field. ​Step 4: To set the upper limit of the applied domain, tap ∞. Then type 2500 in the input field. 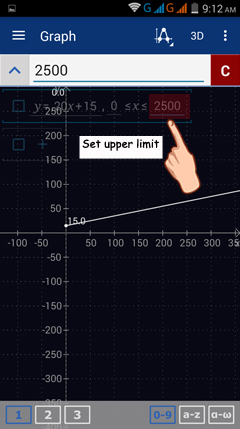 ​Step 5: In the workspace, the line segment will be restricted from 0 to 2500 as shown below. 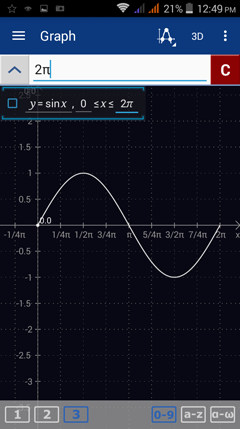 Sketch the graph of each function defined at the given interval of values. Tap -∞ and type -15 in the input field. Tap ∞ and type 15 in the input field. Tap -∞ and type -10 in the input field. Tap ∞ and type 10 in the input field. Tap -∞ and type -5 in the input field. Tap ∞ and type 5 in the input field. Tap -∞ and type 0 in the input field. Tap ∞ and type 2π in the input field. 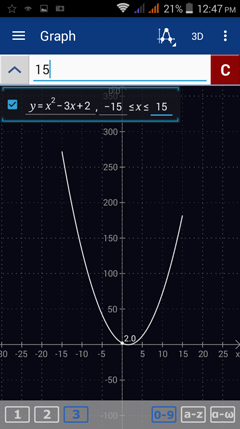 Note: To display x-values in terms of π, go to Settings > Graph > x-axis > Radians.